At Performance Concrete Polishing, our motto is, “Making concrete surfaces attractive.” However, we also want those surfaces to be user-friendly. Think of your warehouse or manufacturing floor. Do your forklift operators complain about how rough the floors are in the areas where they operate their equipment? This problem is usually caused by deteriorated expansion joints or fractures. Expansion joints and fractures tend to break off at the edges (spall) over time, especially if there is constant heavy traffic in those areas. Expansion joints and fractures may also begin to lip up or cup at the edges. All of these conditions cause a very rough ride for any hard tired equipment operating in those areas. A new expansion joint is usually cut about ¼” wide by 1” deep. If an expansion joint starts to exceed ½”, most hard-tired equipment will start to experience a jolt or bounce when crossing the area. This can be a very uncomfortable experience for employees that operate the equipment on a regular basis. Performance Concrete Polishing can make those rough expansion joints and fractures smooth again. We use techniques and products that result in a smooth, durable and long-lasting expansion joint or fracture. This is a cost-effective way to fix the problem without the massive cost of replacing large areas of concrete floor. Give us a call, if you would like us to visit and evaluate you warehouse or manufacturing floors. Our evaluations and quotes are no cost to any potential client! Plus, if you are tired of dirty carpeting or boring vinyl tile in your office space, we’d be happy to show you all the alternatives that can make the underlying concrete beautiful and easy to maintain. 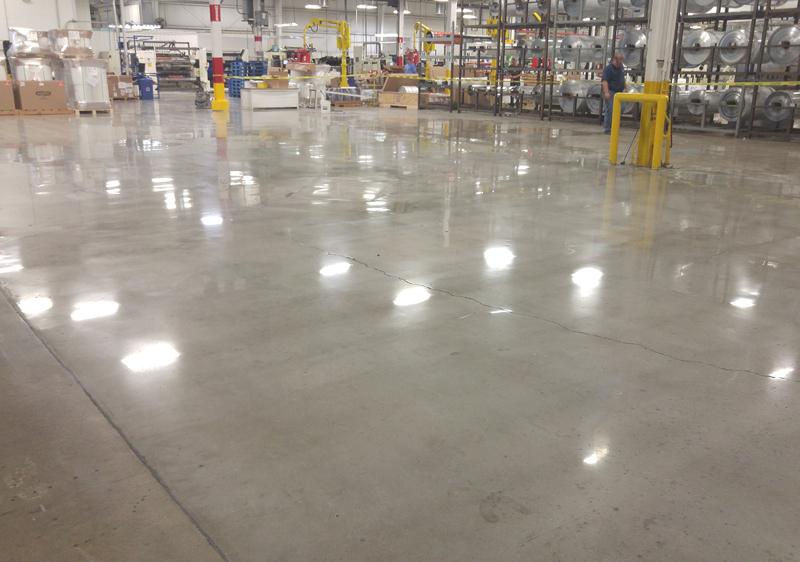 Polished concrete and concrete coatings make for beautiful and durable office floors. On top of this, we also enjoy doing residential projects of all types: garages, basements, driveways and patios. We now accept all major credit cards and provide financing! Visit our website or showroom for more ideas.